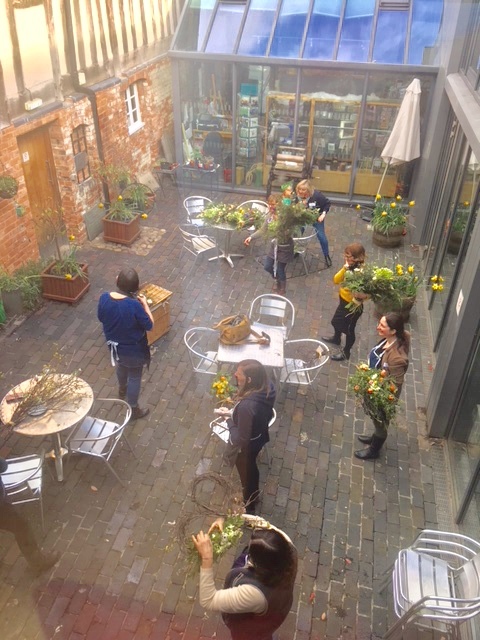 From time to time I offer specialist workshops for practising florists who want to learn more about using locally grown materials for natural style arrangements. If you’d like to be notified of any upcoming florist workshops, sign up for my mailing list here. Recent workshops include a Natural Funeral Flowers workshop, focussing on eco-friendly designs. I can’t think of anything I would have changed re the workshop. It had a good balance between the theory /information and practical side. I also felt that you put things across in such a lovely, caring, honest and natural way and are very approachable. It made the whole day so enjoyable, rewarding and relaxing. I really enjoyed it all and would definitely recommend to others. Julie Williams March 2019, Natural Funeral Flowers Workshop. Thank you so much for the photos of a wonderful experience. I thought it was an excellent day and full of amazing stuff. I really appreciated the extremely well thought out and presented programme, the skilled and lovely women with a shared passion and a thirst for learning, the excellent information based on hard work, trial and error, generous sharing of your aesthetic and business knowledge, high quality materials to work with, time to experiment with your support and really good tips about presentation and use of social media. It has given me so much food for thought, ideas and a helpful shove in the direction of something I’d love to do combined with a real sense of how much there is to learn! I really enjoyed the workshop, you’re a great inspiration! All the information, photos, demonstration and practical session pulled it all together so well! I feel that I’ve got much more confidence to start promoting doing funeral flowers now. Claire Clark, Peartree House Flowers, March 2019, Natural Funeral Flowers Workshop. Thank you very much for today, I thoroughly enjoyed the workshop and also having the opportunity to meet yourself, other flower farmers and florists. I learned lots of useful information and feel much more confident about approaching funeral directors and suitable designs that are simply stunning. Thanks also for the photos, I’ve never seen my floristry looking so professional! Also a big well done to you, your style of teaching and sense of humour is just what this subject needs 👍. Thank you so much for a wonderful day yesterday – so helpful and informative. Your relaxed style of teaching was wonderful, a breath of fresh air and inspirational … Hope to see you again.